We’re eating hearty chicken, andouille sausage & tasso ham gumbo thickened with dark roux and okra, served over white rice with a garnish of sliced green onions and a healthy dose of hot sauce. Hellooooo football season! Every January once the bowl games have ended and the NFL season is wrapping up, I start counting down the days until the first game I really care about. (LSU, duh.) As September gets closer I’ve even been known to count the hours or seconds even until kickoff. It should come as no surprise then, that since I learned to love football while taking the long road through my undergrad at LSU, cajun tailgating food is near and dear to my heart! This month the recipes I’m developing using Knorr Homestyle Stock are tailgating themed. There was no way that I was gonna pass up the opportunity to make a pot of gumbo just in time for LSU’s opening game against Oregon!!! GEAUX TIGERS! The tigers pulled off a big victory over the #3 ranked team in the nation and I pulled off a hella good pot of gumbo. Pretty sure this was the best gumbo I’ve ever made. Ever. And this biatch has made some gumbo. As always, with soups or stews (or anything braised) it’s better if you make it at least a day in advance… which is perfect for tailgating. All you have to do on game day is heat up the pot, crack a beer and you’re GTG! *Side note: As I mention in the footer of the recipe below – don’t stress out if you can’t find tasso ham or andouille sausage. You can simply substitute any smoked ham steak or any smoked sausage of your choice. It’ll still be delicious. I swear. Place a large stock pot over medium-high heat. Preheat for 3 minutes then add canola oil to the pot. Add andouille sausage. Brown sausage, stirring occasionally, for about 3-5 minutes. Remove sausage from pot & set aside to cool then refrigerate until needed. Leave all rendered fat in the pot then return to the heat. While the sausage is browning, season chicken thighs with kosher salt and freshly cracked black pepper on all sides. Brown chicken thighs in the rendered fat over medium-high heat for about 3 minutes per side until caramelized. Cook in two batches if necessary to not over-crowd the pot. Remove chicken from pot and set aside. Drain off all remaining oil. Reduce heat to medium-low. Place butter in pot. Melt butter then stir in all-purpose flour to make the roux. Cook the roux over medium-low heat stirring constantly until roux turns a nutty deep amber, about 30-45 minutes. 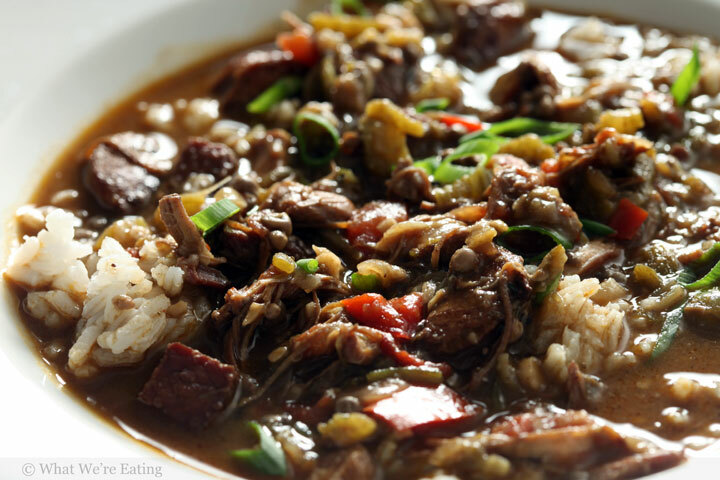 Remove from heat and allow gumbo to cool at room temperature for 1 hour. Once cool, refrigerate at least 12 hours and up to 2 days to allow flavors to marry. Remove from fridge and scrape off the layer of fat that has solidified on top. Reheat gumbo over medium heat until hot then serve over white rice with hot sauce and sliced green onions. *If you have trouble finding Tasso Ham or Andouille sausage, feel free to substitute any smoked ham steak or smoked sausage you can find. Try Kitchen Basics stock! It is WONDERFUL! Glad you make your own roux. We have good jarred roux in La. (don’t poo poo it’s just flour and fat browned and jarred. Just as good or better than the hour & 1/2 it would take to make it for enuf to serve 6-10). I’ve lived in Acadiana for 20 years) This recipe would make any Cajun proud! Thank you! Keep posting your feasts. I have enjoyed them all including the King Cake post. On the recipe, could you clarify how much is a “tub” of chicken stock. Matt – the product Knorr Homestyle Stock comes in a little tub. It’s a stock concentrate so if you are using a different kind of stock just sub the 8 cups of water with stock. I saw the foodporn email early this morning. Who knew that I could crave Gumbo in the A.M! Now that is a pot of serious happiness!! My husband would be a happy camper if i served this up to him in addition to his Sunday football. Nicely done!! Really homemade. I like organic food so celery, thyme and paprika make my day. But that aside, this recipe runs along our courgette fajitas which is almost our staple. Thanks for the recipe, but couldn’t you just come over and make it at my house again? Girllll.. You got some mad-crazy skills in the kitchen. This looks so football flipp’n good. But I agree with Nicole; couodn’t ya just come and make it for muah? GEAUX TIGERS!??? LOL too funny! Yum LOVE gumbo and have only made it once about a hundred years ago! We’d love this one and my sons would actually prefer this to a classic shrimp gumbo which I love. I must try this this autumn! Looks fabulous! Jamie – not gonna lie – I’m a die hard LSU football fan! AND a gumbo fan! Promise you’ll love it if you make it… and maybe it’ll take you back to Nola in your mind! xoxo! For a healthier less greasy dish (not to mention it’s easier and faster), you can make a fat-free roux by placing the same amount of flour on a baking sheet in the oven for about 20 mn. You don’t have to stir for 45 mn and the result is the same except less fat. Sounds great; but I think you mean to stir the roux for 45 SECONDS, not minutes, right?